Join one of our existing public classes, private classes listed below or get a group of friends together and host private lessons in your home or local facility. Instruction includes a handout and detailed illustration of concepts using cards on the table approach with pre dealt hands to illustrate the concepts. Hosting at an individual’s home brings down the prices or I can secure rental at one of the local facilities I have access to in Arlington, VA. If you are interested in me securing a facility and have a reasonable size group, I can investigate other facilities in your area. Class Size: Groups of 4 people only are given individual attention in play of the hand, basic bidding, and defense to improve their bridge game and make them competitive in the duplicate or rubber bridge world. Methodology: We will play 12 to 16 hands. Each hand will be discussed with the players as to the bidding, play, and defense to improve understanding of ways to improve each area. The teacher will discuss the highlights of each hand with the students. Materials needed are pads to take notes. Card Table, bridge hands will be provided by the teacher. Cost: TBD depending on lessons purchased – Four, six, or eight week packages available. The dates for the sessions will be discussed with students depending on the players availability to all meet for lessons. Call Gene at (703) 286-5959 for availability, pricing and more information. Private Classes are currently being held at the following locations. Time: 5:15 – 7:15 P.M.
Space is limited and reservations only will be accepted for this course.
' This set of 8 lessons focuses on the basics of leading against no trump and suit contract and keeping your objectives in play as you lead, including 2nd hand play and some of the major exceptions that you must consider when playing, third hand play and exceptions based on the entire hand for defense, the basics of carding when following and signaling when lacking a suit that is led, defensive hand types and focusing on working together on defense. - Please note: because of the St. Peter\'s children\'s musical it will probably be necessary to postpone the March 7th lesson until March 14th Forty percent of tuition payments are donated to St. Peter\'s and therefore tax deductible. View our current schedule of private small group bridge lessons. View our current schedule of public group bridge classes.
' In these lessons will cover eight to twelve hands that will be bid, played and defended. Each table plays the same hands going over elementary concepts of bidding, play, and defense as well as competitive bidding concepts. Apply what you have learned in other courses.
' 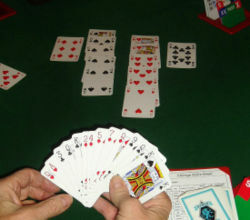 This set of 8 lessons focuses on the basics of leading against no trump and suit contract and keeping your objectives in play as you lead, including 2nd hand play and some of the major exceptions that you must consider when playing, third hand play and exceptions based on the entire hand for defense, the basics of carding when following and signaling when lacking a suit that is led, defensive hand types and focusing on working together on defense.
' We will play 12 to 16 hands. Each hand will be discussed with the players as to the bidding, play, and defense to improve understanding of ways to improve each area. The teacher will discuss the highlights of each hand with the students. Materials needed are pads to take notes. Card Table, bridge hands will be provided by the teacher.